This ideally located property is within a short walk of the sandy Arenal beach, bars and facilities and was completely refurbished in 2014. . 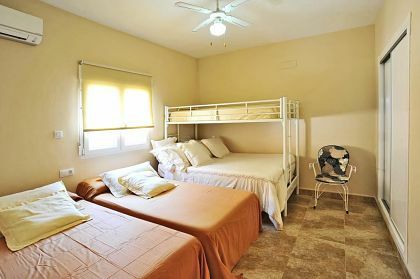 Unusually, this property was constructed within the Arenal area of Javea which is a popular destination for family holidays and enjoys the benefits of being within a very short walk of the beach. Completely refurbished in refurbishied in recent years, the house boasts four large double bedrooms, three modern bathrooms and a new kitchen.. The property is accessed via the road through double gates that lead to a covered parking area which can easily accomadate three cars. Walking across the low maintanance garden, passing the fruit trees you arrive to a shady, south facing naya that in turn leads to the front door.. Inside the house, the bright living room features an open fire place and barrelled ceilings. A corridoor then leads off to a good sized modern kitchen and a further three bedrooms and two new bathrooms. The fourth larger bedroom is accessed externally and has its own ensuite bathroom and the potential as an independant apartment. . The entire property is hot and cold airconditioned, PVC double glazed and constructed on a flat plot. The location of this property merits consideration as properties within the distance of the beach usually command higher prices.